An unknown kind of music triggers release of dopamine. This may be related to my previous question about "psychoactive music"
Is there evidence to support the claim that music can trigger the release of specific neurotransmitters in the brain? Music is known as a form of an abstract stimulus, which can arouse feelings of euphoria, similar to tangible rewards that involve the striatal (corpus striatum) dopamine system. In a study, published in nature neuroscience, researchers used the neurochemical specificity of 11C Raclopride positron emission tomography scanning, combined with psychophysiological measures of autonomic nervous system activity, to find endogenous dopamine release in the striatum at peak emotional arousal during music listening. To examine the time course of dopamine release, they used functional magnetic resonance imaging with the same stimuli and listeners, and found a functional dissociation: the caudate was more involved during the anticipation and the nucleus accumbens was more involved during the experience of peak emotional responses to music. 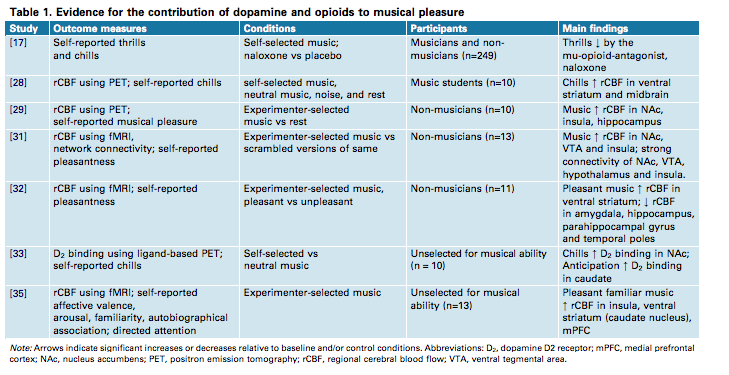 These results indicate that intense pleasure in response to music can lead to dopamine release in the striatal system. 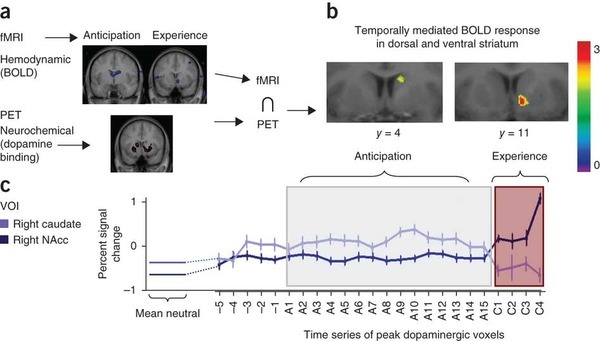 Notably, the anticipation of an abstract reward can result in dopamine release in an anatomical pathway distinct from that associated with the peak pleasure itself. Music characterized by genres and musical elements evoke distinct patterns of messenger production.Music of Johann Strauss caused rises in atrial filling fraction and atrial natriuretic peptide and falls in cortisol and tissue-type plasminogen activator (t-PA). Prolactin, cortisol, noradrenaline, and t-PA concentrations decreased after listening to the music of H.W. Henze. Ravi Shankar’s music resulted in lowered concentrations of cortisol, noradrenaline, and t-PA.Listening to techno music was found to alter levels of b-endorphin, adrenocorticotropic hormone (ACTH), norepinephrine , growth hormone, prolactin, and cortisol in healthy people.Critically ill patients who listened to Mozart’s slow piano sonatas had increased growth hormone and decreased interleukin (IL)6 levels. Disclaimer: I will keep editing my answer, this is just a start! Krumhansl, C.L. An exploratory study of musical emotions and psychophysiology. Can. J. Exp. Psychol. 51, 336–353 (1997). Egerton, A. et al. The dopaminergic basis of human behaviors: a review of molecular imaging studies. Neurosci. Biobehav. Rev. 33, 1109–1132 (2009). Dube, L. & Lebel, J. The content and structure of laypeople’s concept of pleasure. Cogn. Emot. 17, 263–295 (2003). Sloboda, J. & Juslin, P.N. Psychological perspectives on music and emotion. in Music and Emotion: Theory and Research (ed. Sloboda, J.) 71–104 (Oxford University Press, Oxford, 2001). Möckel M, Röcker L, Stoörk T. Immediate physiological responses of healthy volunteers to different types of music: cardiovascular,hormonal and mental changes. Eur J Appl Physiol. 1994;68(6):451-459. Gerra G, Zaimovic A, Franchini D, et al. Neuroendocrine Responses of healthy volunteers to ‘techno-music’: relationships with personality traits and emotional state. Int J Psychophysiol.1998;28(1):99-111. Not the answer you're looking for? Browse other questions tagged cognitive-neuroscience music or ask your own question. Is there evidence of suppression of the frontal cortex during herding behavior? Is there evidence to suggest that one's epistemic preference is fixed or is flexible?